What a season. 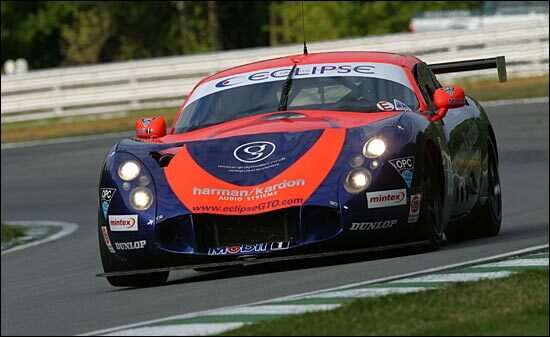 There was little hope part way into the 2003 season that the Eclipse Motorsport TVR T400R would be able to challenge the pair of Moslers (from Rollcentre Racing and Balfe Motorsport) for overall GTO honours. But a string of consistency – and two excellent wins - kept the #69 car well in contention and when the Moslers faltered Eclipse took full advantage. 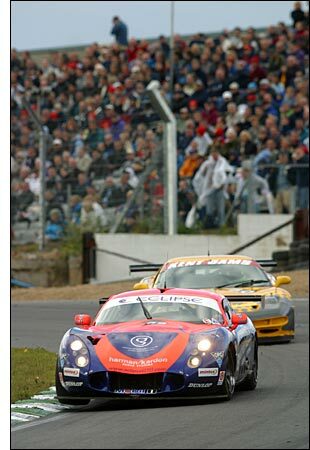 Silverstone, where they won the historic British Empire Trophy, and Oulton Park, brought them into the title battle in earnest. Coming into the final round at Brands Hatch, the team held the enviable record of being the only one that had been classified in every round, the only non-finish being in the final moments of the Castle Combe race. With just five points separating the top three teams, it was all to play for in the final race. 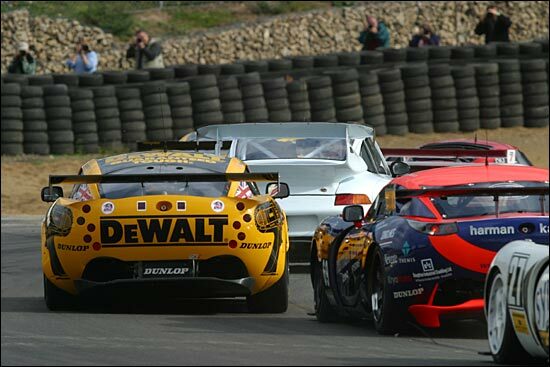 With the addition of both DeWalt TVRs and an old stager in the form of the extremely rapid GT class Point Preparation Porsche 911 GT2, qualifying was less predictable than usual. Piers Johnson pushed hard to put the #69 car (complete with a weighty 45kilos of success ballast) in a position where Shane Lynch could strut his stuff on Sunday afternoon. Fifth on the grid would do nicely. Shane made his usual lightning start, but emerged from the Paddock sort out in fifth slot - behind the championship leading Balfe Motorsport but ahead of the Rollcentre Racing version. By lap 3, the situation had changed dramatically. With waved yellows at Paddock Hill Bend to protect the site of Rob Well’s trip into the tyre wall in the Team Aero Morgan, the Balfe Mosler slowed, but Bob Berridge in the #92 De Walt TVR didn’t. Whether it was a mechanical failure or brain fade the effect was dramatic: Jamie Derbyshire’s race was over in a matter of metres as the TVR clattered the Mosler into the gravel. Berridge struggled round to pit and retire too. It was a terribly sad way for the Balfe Motorsport team’s campaign to end - but Eclipse were third and were now in a championship winning position. The battle for the race win was between the GT class Porsche and Rob Barff in the #91 TVR and Barff was tracking the big white 911 – but then suddenly he wasn’t! The TVR had pulled off with a broken throttle cable, the Porsche pulled clear and Shane was up to second overall, the Rollcentre Mosler back in fifth. 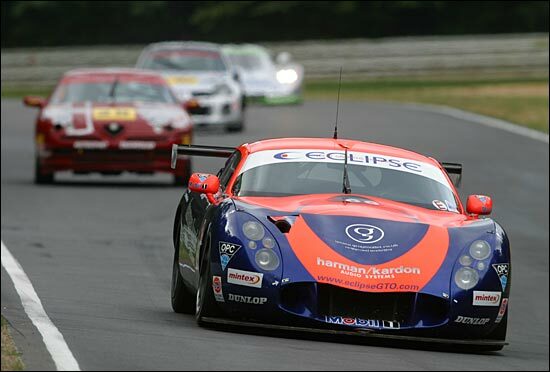 If it stayed like this….but does it ever stay static for long in the British GT Championship? Shane was holding off the challenge from fellow Irishman Peter Le Bas in the Xero Corvette and Steve Hyde in the CDL TVR. The chase was closely and cleanly fought for lap after lap until, at the 25 minute mark, as the pit stop window approached, the trio barrelled over Sheene Curve’s blind brow to find Alan Bonner’s ISL Marcos broadside across the road. There was a split second to make a decision and Shane chose to go for the gap on the left, to take the inside line for the turn beyond. It would have been the correct decision had the Marcos not chosen that moment to roll back into the TVR’s path: the impact with the side of the TVR was enough to send the T400R spearing into the barriers. 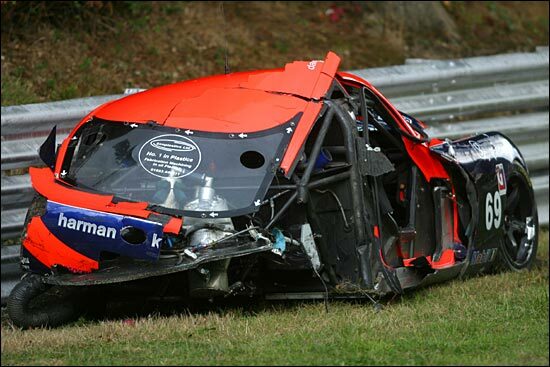 The damage was horrendous - the front and rear of the car totally destroyed - but mercifully the car’s rollcage did its job perfectly and a shaken Shane was out immediately, his head shaking in disbelief, Eclipse’s race and championship fight over. Shane was distraught of course, while poor Piers didn’t even get in the car. So near yet…. It was left to Tom Herridge and Martin Short to steer the sole remaining title contender in the race, the Rollcentre Racing Mosler, to the finish to complete a run from third in the points table for Herridge (prior to the Brands Hatch race) to the series championship at the chequered flag. Congratulations to him and to team boss Martin Short (and thanks for building the TVR’s rollcage so well, Martin). It may seem a strange sentiment after such a disappointment at Brands, but everybody at dailysportscar would like to congratulate everyone at Eclipse, from Shane and Piers to John and Chris, Grant, Graham, Steve, Andy, Mark and Mickey - and not forgetting of course fellow Empire Trophy winner Ben McLoughlin and Spa supersub Simon Pullan. 2003 has been the season that brought the team truly into contention: the car has been beautifully prepared, stunningly reliable and consistently competitive. It has brought them a new band of fans and even deeper respect amongst their racing peers. The best thing about it though is that the guys haven’t changed, not one little bit. You don’t have to be miserable to be winners, I know, I’ve been following the team that runs the pretty orange TVR all season. See you back out there in 2004 boys.